The TIME 100  Are They Worthy? PRO: The first woman to lead the company, she's known as a champion of corporate social responsibility. 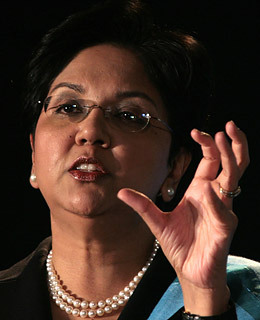 She's also overseeing the move towards healthier offerings in the $35 billion giant's snack and soda portfolio. CON: There's competition from Coke, hostility from anti-obesity activists who regard all packaged snacks as an unnecessary dose of calories, plus the typical array of global problems; green groups in India caused a kerfuffle recently by claiming Pepsi is laced with pesticides.